The conga is a tall, narrow, single-headed Cuban drum of African origin, probably derived from the Congolese Makuta drums. The Cuban conga is staved, like a barrel. These drums were probably made originally from salvaged barrels. They were used both in Afro-Caribbean religious music and as the principal instrument in rumba. Congas are now very common in Latin music, including salsa music, as well as many other forms of American popular music. A percussionist who specializes in playing the conga is called a "conguero." Most modern congas have a staved wooden or fiberglass shell, and a screw-tensioned drumhead. They are usually played in sets of two to four with the fingers and palms of the hand. Typical congas stand approximately 75 cm from the bottom of the shell to the head. The drums may be played while seated or they may be mounted on a rack or stand to permit the player to play while standing. In English, "conga" can refer to drums of a number of sizes. The names for the individual drums vary even in Cuba. 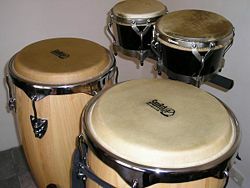 As many as six different drums are included in the conga family: The supertumba is the largest, followed by the tumba, conga, quinto, requinto, and ricardo. The drum that is called a "conga" in English is sometimes called a tumba or tumbadora in Spanish. Some sources give tumba for the largest drum and niño for the smallest. The term conga was popularized in the 1950s, when Latin music swept the United States. Cuban son music and New York jazz fused together to create what was then termed mambo, but later became known as salsa. In that same period, the popularity of the Conga Line helped to spread this new term. In Spanish, conga players are called congueros, while rumberos refers to those who dance following the path of the players. The word conga came from the rhythm la conga used during Carnival in Cuba. The drums used in Carnival could have been referred to as tambores de conga since they played the rhythm la conga. Open tone: Played with the four fingers near the rim of the head, producing a clear resonant tone with a distinct pitch. Muffled tone: Also created by striking the drum with the four fingers, but holding the fingers against the head to muffle the tone. Bass tone: Played with the full palm on the head, producing a low muted sound. Slap: A difficult technique producing a loud clear "popping" sound; known as a floreo when played quickly at short intervals. Touch: Produced by touching the fingers or heel of the palm to the drum head. It is possible to combine a touch of the palm with a touch of the fingers in a maneuver called heel-toe, which can be used to produce the conga equivalent of drum-rolls. To bend the pitch of the conga, a conguero sometimes places his elbow on different parts of the drum head, causing the pitch to change. This is not a traditional stroke, but it is common in modern salsa and rumba. Conga drums are tunable to different notes. The original drums were tuned by adjusting knots and tension ropes on the drumhead, or, where the drum-heads were tacked or nailed to the top of the shell, by careful heating of the head. Modern congas use a screw-and-lug, tension head system which makes them easier to tune (or detune). As was discussed above, terminology for the drums varies. Here, the naming system used is a composite of those mentioned before with those currently in use my major conga manufacturers. The drums are discussed in order from largest to smallest; the sizes of the drumheads given vary considerably by manufacturer, model, and style. Congas, being percussive instruments, do not have to be tuned to any particular note in purely percussive settings. However, when playing with harmonic instruments, they may be tuned to specific notes. Generally congas are tuned using the open tone. In general, the particular note will depend on the make, model, and size of the conga drum. The drum should be tuned so that the bass tone resonates, the open tone rings, and the slaps pierce through the musical mix. If the tuning is too loose, the bass and slap tones will sound "flabby"; too tight, and the drums will sound unnatural and "pinched." With a single drum, it is difficult to go wrong with tightening the drum until it makes a pleasing sound. When two or more drums are used, however, there is much variation on which two notes are chosen. With two drums, it is not unusual to find them tuned a perfect fourth apart (the same interval used in "Here Comes the Bride"). Having three drums (typically the tumba, conga, and quinto) invites experimentation and individual customization. Some congueros like using the intervals of a major chord (e.g. F, A, C); some use the second inversion of a major chord (for example, G, C, E); and some prefer a major second between the quinto and conga, with a perfect 4th descending to the tumba. Raul Rekow of Santana often plays five conga drums and chooses to tune them to the opening phrase of a Latin tune he likes. The conga derived its importance because of the way its music could speak to musicians and listeners. Born from Cuban percussionists, the conga's impact lies in its cultural ties with Cuban traditional and commercial music and its present use in popular Carnival, Mardi Gras, or night club music in the United States. With the different strokes which can be applied during the playing of the drums, the conga can be felt melodically, harmonically and rhythmically through the manipulations of the performers. This carved out an important niche within the Cuban and African ensembles which feature its unique and personal sounds. In the United States, Desi Arnez was among the first mainstream artists to introduce the conga-type drum to a larger audience though the medium of television. Candido Camero is a Cuban percussionist played congas for many Afro-Cuban jazz acts since the 1950s. In later popular music the conga became an important aspect of percussion sections largely due to the influence of guitarist Carlos Santana who synthesized Latin musical elements with more traditional pop elements. Other popular Latin artists who used congas and Latin percussion in their arrangements include Gloria Estefan, Ricky Martin, Shakira, Jennifer Lopez and Marc Anthony. The popular rock-jazz band Chicago added Brazilian percussionist, Laudir DeOliveira to the group's line-up in 1974 and used conga drums in a number of their hit songs including Call on Me. 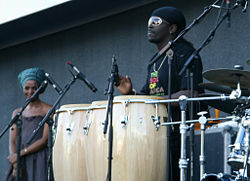 The Detroit-based R & B band, Rare Earth used conga drums prominently in several of their chart-topping hits for Motown Records, including I Just Want to Celebrate, Hey, Big Brother, and Get Ready. The Motown standard, Standing in the Shadows of Love features the conga work of Eddie "Bongo" Brown, a musician who performed on many other Motown tracks. The conga has also been featured in the fusion of Latin and Jazz music. As Latin-Jazz composers utilized the elements of Samba and Bossa Nova in the rhythmic aspects of their music, the use of conga drums defined the musical arrangements by such artists as Antonio Carlos Jobim and João Gilberto. In Latin jazz bands, percussion is a prominent element and thus the conga becomes an integral part of the Latin percussion section. Long-time Duke Ellington arranger, Maurice Peress, used conga drums in his orchestral version of Ellington's Jazz suite, Three Black Kings. Jazz trumpeter, Dizzy Gillespie used conga drums in his arrangements in the late 1940s when he collaborated with Cuban conga virtuoso, Chano Pozo resulting in a style referred to by some as "Cubop." The conga drum and its popular relatives—bongos and timbales—have found their way into the scores on numerous late-twentieth century composers such as Joseph Schwantner, Susan Botti, William Kraft and Tan Dun. The popular Argentine-Jewish composer Osvaldo Golijov uses conga drums in his score of his setting of St. Mark's Passion which was composed to honor the 250th Anniversary of Johann Sebastian Bach's seminal work of the same scriptural text and has a decidedly Latin influence. Dworsky, Alan, and Betty Sansby. Conga Drumming: A Beginner's Guide to Playing with Time. Dancing Hands, 1995. ISBN 0963880101. Jacobs, Sam. Modern Conga Method. Jamaica, New York: Sam Jacobs Music, 2007. ISBN 9780970941909. Leymarie, Isabelle. Cuban Fire: The Saga of Salsa and Latin Jazz. London: Continuum, 2002. ISBN 0826455867. Sanchez, Poncho, and Chuck Silverman. Poncho Sanchez' Conga Cookbook. Cherry Lane Music, 2002. ISBN 1575603632. Warden, Nolan. A History of the Conga Drum. Retrieved November 18, 2008. This page was last modified on 20 March 2017, at 16:02.